"Next to Leonardo da Vinci, Joe Cook is the most versatile man known to recorded times." - The New York Times. Joe Cook rose to the highest echelon of vaudeville, headlining at New York's famed Palace Theatre. He triumphed on Broadway and then broke into radio. 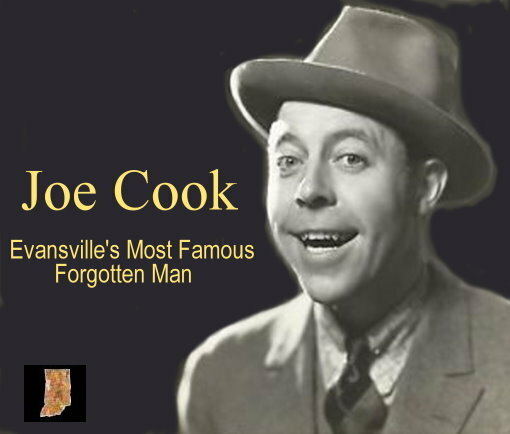 A household name in the 1920s and 1930s, Cook was one of America's most popular entertainers. Born Joe Lopez in Evansville, Indiana in 1890, he was orphaned and adopted by relatives at the age of three. He lived in the back of the grocery store of his adoptive parents at the corner of Fourth and Oak in Evansville. Cook joined a circus in 1906 which propelled him to vaudeville, Broadway and Hollywood. Joe Cook's physical talents were remarkable. He was an incredible juggler, could walk a tightrope, ride a unicycle, mime, and perform many other circus skills with ease. With this he combined an uncanny ability to tell nonsensical stories that made audiences roar with laughter. Added to this was his penchant for creating ridiculously complex inventions to perform absurdly simple or totally useless tasks. Mix in a little piano, violin, and ukulele playing and you had quite a show. The broad variety of Cook's act led to his nickname – "One Man Vaudeville." New York Times critic Brooks Atkinson once wrote, "Next to Leonardo da Vinci, Joe Cook is the most versatile man known to recorded times." In 1930, noted columnist Walter Winchell wrote that "Joe Cook is certainly one of the musical theatre's three geniuses. I can't at the moment think of the other two." "I will give an imitation of four Hawaiians. This is one [whistles]; this is another [plays ukulele]; and this is the third [marks time with his foot]. I could imitate four Hawaiians just as easily, but I will tell you the reason why I don't do it. You see, I bought a horse for $50 and it turned out to be a running horse. I was offered $15,000 for him, and I took it. I built a house for the $15,000, and when it was finished, a neighbor offered me $100,000 for it. He said my house stood right where he wanted to dig a well. So I took the $100,000 to accommodate him. I invested the $100,000 on peanuts, and that year, there was a peanut famine, so I sold the peanuts for $350,000. Now why should a man with $350,000 bother to imitate four Hawaiians?" Never a fan of Hollywood, Cook made only two full-length movies, which is a major reason he is not widely remembered today. In 1930, he starred in the film version of Rain or Shine, which was directed by a young Frank Capra and is still shown occasionally on television. It has recently been completely restored and will be permanently preserved by Sony Pictures, the successor of Columbia Pictures. Cook's only other feature movie, Arizona Mahoney, was filmed in 1936 and included a young Larry "Buster" Crabbe. The 1930s also saw Cook's successful transition into the new medium of radio, as the host of two variety series and a frequent guest on many others. Cook, from 1924-1941, made his residence at Lake Hopatcong, in Hopatcong, New Jersey, which was then a popular resort. His house was appropriately named "Sleepless Hollow" for the many parties he gave and celebrities he entertained. One visitor, his librettist Donald Ogden Stewart, later recalled that "Joe lived on a mad gag-infested estate in New Jersey which bewilderingly expressed his genius. On his three-hole golf course one drove off confidently into what looked like a fairway only to have one's ball rebound sharply over one's head from a huge rock which had been cunningly camouflaged. The last green was a golfer's paradise in that no matter where the ball landed it rolled obediently into the hole. Conditions inside the house were similarly deranged. The "butler" was one of the contortionists, acrobats, midgets or other show-business people whom Joe had picked up his years in Vaudeville. Poor Mrs. Cook lived bravely in this cuckooland and struggled apologetically to bring some degree of common sense into the madhouse." The Cook house still survives at Lake Hopatcong but is not open to the public. Cook was diagnosed with Parkinson's Disease in 1941. This forced his retirement from show business. He sold the lake house the same year. Joe Cook died in 1959.